Healthy and hearty cafe fare in Glen Waverley. 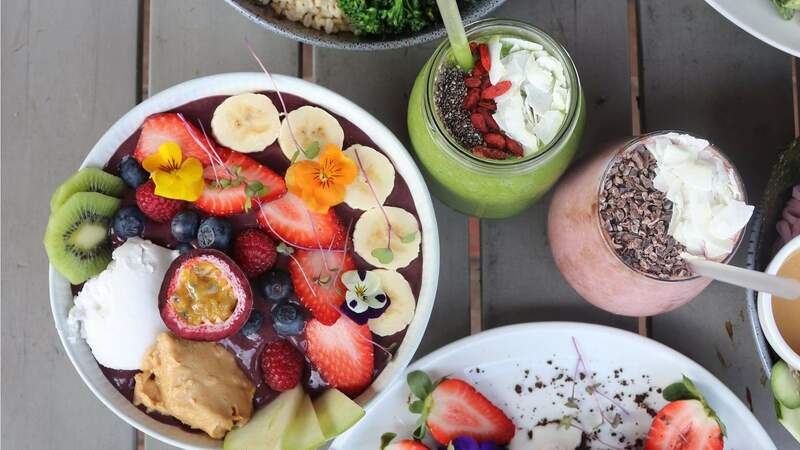 Glen Waverley might not be Melbourne's biggest food hub, but Trei Cafe's opening on Blackburn Road has got has foodies running southeast. Boasting a clean eating menu options and playful pastel features, order yourself a Snickers smoothie bowl and prepare for the healthiest bowl of chocolate ever. Made with almond mylk, cacao, peanut butter, banana, rice malt syrup and salted peanuts, it's almost certainly the best (and nuttiest) start to the day. It's also running a cracker of a special this year, offering all vegan dishes for only $13. Yep, for less than a lobster you can enjoy cookies and cream hotcakes, mushroom burgers, veggie bowls, curried lentils, sushi bowls and the aforementioned acai bowls. If you're an animal-loving coeliac, you'll be looked after, too. With five gluten-free vegan dishes also on offer for only $13 dollarydoos. If you stopped reading at cookies and cream hotcakes and are organising in a trip already we hardly blame you – however, there's no rush. The vegan menu special will be running through to the end of the year, plenty of time to get yourself there an enough times to try everything.